Descriptions of varieties presently growing in our orchard in Lodi, NY. They are listed below in order of harvest. 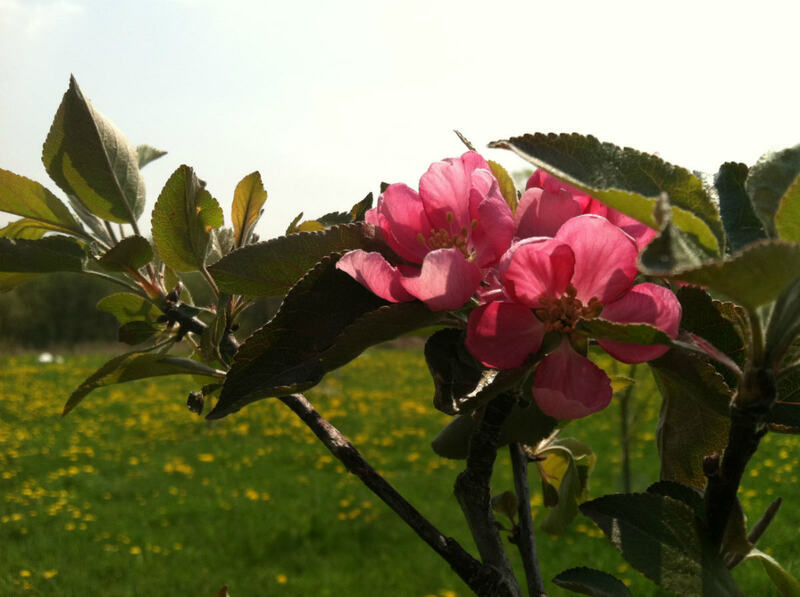 For descriptions of other fruit trees grown at Sage Hen Farm, go to our pages forApples, Pears, Plums & Cherries. Merits: bud hardy; showy blooms; slow or non-browning fruit; moderately resistant to bacterial spot. Merits: bud hardy; showy blooms; non-browning fruit; reliable, productive; less susceptible to peach leaf curl moderately resistant to bacterial spot. New Brunswick, NJ, introduced by New Jersey Agricultural Experiment Station,1990 in conjunction with Stark Brothers of Missouri. Merits: showy blooms; non-browning fruit; some resistance to peach leaf curl; resistant to bacterial spot. Merits: bud hardy; moderately resistant to bacterial spot. 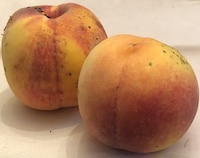 Special: more popular in England than in US; was the most popular peach on the Puget Sound islands during the early 20th Century; very rare in the US. Merits: bud hardy; reliable & productive; non-browning fruit; aromatic; moderately resistant to bacterial spot. Middleton, NJ, introduced by William Crawford in 1840? Merits: moderately resistant to bacterial spot. Merits: bud hardy; showy blooms; reliable, usually very productive;moderately resistant to bacterial spot. Special: considered tpo be better for canning than fresh eating, and although it is usually rated as only fair in flavor, we've enjoyed its fruits right off the tree. Perhaps we are in just the right climate for it. Uncertain. Tree or seed of Oldmixon Cling brought to America cirxa 1820. Oldmixon Free first mentioned in 1832. Special: There is an origin story that the first Oldmixon peach was planted by Sir John Oldmixon the pamphleteer and historian, but he died in 1742 and never traveled to the New World. It may have been brought to America by an unrelated John Oldmixon who died in America in 1818, but the peach is more likely to have been named in honor the old Whig polemicist, instead. Faults: tardy in bearing; rather unproductive; susceptable to bacterial spot. Bloom and Harvest: Bloom dates are vague, but since the earliest and latest blossoming trees have overlapped, I haven't paid as much attention to the actual dates. Harvest dates are not as exact as they may appear. They are based on the average date, August 15, that we have picked Red Haven peaches, and the number or days before or after the other varieties are usually ripe. Tree Vigor and Hardiness: Vigor means how large or small the tree will grow. T3 are larger trees that can reach 20 feet without dwarfing rootstock or regular pruning. T1 are naturally dwarfing trees that may only reach 8 to 10 feet even without dwarfing rootstock or pruning. Hardiness is based on how likely the tree will thrive based on the average annual minimum winter temperature using the 2012 USDA Plant Hardiness Zone Map as a guide. Zone 4's range is -20 to -30 (Fahrenheit) or -28.9 to -34.4 (Celsius). Zone 5's range is -10 to -20 (Fahrenheit) or -23.3 to-28.9 (Celsius). 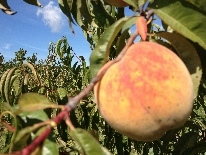 However, growing peaches in a frost pocket in the Finger Lakes region of New York State has been a challenge. We do not expect peach harvests every year, and we do not expect bountiful peach harvests more than once in three to five years. Other Peach Trees: We have tried growing other varieties of peaches, Eden, Finger Lakes Super Hardy, Glowingstar, Hale Haven, Loring, and Reliance. Finger Lakes Super Hardy has not been available since Stark Brothers took over the Miller Nursery of Canandaigua, NY, which had been the exclusive proprietor of that variety. I'm not sure the reason ours died (we tried twice), probably not because of lack of hardiness. Its fruits were fine but not outstanding. U. P. Hedrick, George Henry Howe, Orrin Morehouse Taylor, Charles Burton Tubergen.The Peaches of New York. New York State Agricultural Experiment Station, 1917. W. R. Okie. Handbook of Peach and Nectarine Varieties: Performance in the Southeastern United States and Index of Names. U.S. Dept. of Agriculture, Agricultural Research Service, 1998. Growing Fruit Forum one of the best online sources of information about growing fruit, including peaches. This page written and maintained by John R. Henderson [jhenderson @ ithaca.edu].